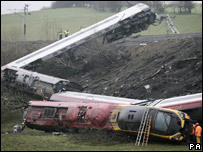 A Virgin Pendolino train has derailed and slid down an embankment in Cumbria, witnesses say. 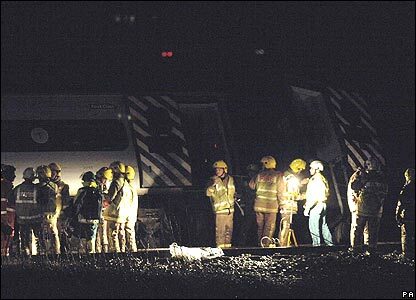 Nine carriages were left on their side, with some "stuck up in the air", passengers said. RAF helicopters, police and fire crews have been sent. It is understood the train was the 1715 GMT Virgin Train from London's Euston Station to Glasgow Central. 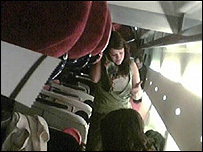 Passenger Caroline Thomson, a BBC executive, said the train seemed to hit something and was lying on its side. The collision is believed to have taken place at Greyrigg Cottage in the Lake District between Oxenholme and Tebay. Ms Thomson said: "The carriage I am in is completely on its side, it did a sort of bump - and I was thinking don't worry this fine - but then the swaying became very dramatic. "Where I am there are some injuries - a woman with a very badly hurt back but I suspect further up the train it's a bit more serious. "What happened was that it suddenly appeared to hit something and then lurched very, very badly from side to side in a very dramatic way. "This a very scary experience." We will be covering this live. 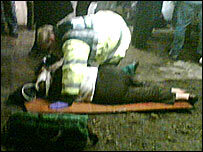 Several casualties, work with British Transport Police. No information on serious injuries. Number for relatives coming soon. 5 to 6 people still trapped. UPDATE: Virgin Train Controller trying to contact driver. Virgin Trains can confirm that a serious incident took place earlier today near Lambrigg, north of Oxenholme in Cumbria. The incident took place shortly after 20:00. The train involved was the 17:15 from London Euston to Glasgow Central, operated by Virgin Trains. Virgin Trains staff are currently working with the emergency services to ensure that those involved in this incident are given every assistance. All Virgin Trains services between Preston and Carlisle have been suspended until further notice. Alternative arrangements for customers, using road vehicles, are being made. We advise passengers to ring National Rail Enquiries on 08457 48 49 50 before commencing their journey. An emergency services number for friends or relatives concerned about anybody travelling on the train will be issued as soon as possible. Virgin Trains will keep you updated as we receive further information. UPDATE: Royal Lancashire hospital expecting casualties in 30mins or so. UPDATE: in passenger terms 180 is nearly half full, not overcrowded. UPDATE: footage from BBC News of the scene on air. "They'll also be looking at the location of the derailment for signs the train may have failed to stop at a signal for some reason - because there is a set of points close to the crash site." said BBC Transport correspondent Tom Symonds. UPDATE: emergency services still not sure if all passengers accounted for. UPDATE From Conference: no more rescues to be affected outside the carriage. END OF UPDATES - News and Commentary will be posted here over the next few days including exclusive images. 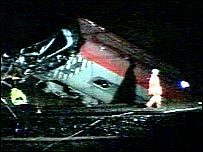 Pitch Black, a lot of flashing lights, emergency vehicles, we can see a carriage dramatically off the line, on an embankment on its side upside down, people underneath, emergency services attending, were not too close, unclear. Near farmhouse, its damp. Virgin Trains can confirm that there has been an incident this evening between Oxenholme and Penrith involving the 1715 London Euston to Glasgow service and that emergency services are in attendance. All emergency services are now there, easy to get too. Cumbria Fire Service said it has five pumps currently at the scene. 3-4 RAF Helicopters and the Merseyside Police helicopter are involved in the rescue operation. The contact number for British Transport Police is 0800 40 50 40. Tractors pulling an ambulance free. Settle Carlisle Railway, Virgin Voyager Trains full of people have passed going south on the Settle and Carlisle Railway (Langwathby, Cumbria), engineering work has been cancelled on the Settle and Carlisle railway to be cleared for diversions. Two Voyagers joined together passed. The west coast mainline has been suspended between Preston and Carlisle. POWER LINKS down and not isolated yet. Only one carriage accessed yet, 8 injured. Reaction from the bloggers around the world has been very fast, to look at the posts, here's a link, however i'm sure more blogs have been updated with this news. Here's some information on whats happened over the night. The woman that died was an eighty year old, no more details have been given. "Everyone is going to have to learn from this incident and Network Rail are going to have to look at this track problem and make sure nothing like this ever happens again"
That is quite horrific, i would like to thank Sam and Will for keeping us up to date with the latest news stories!